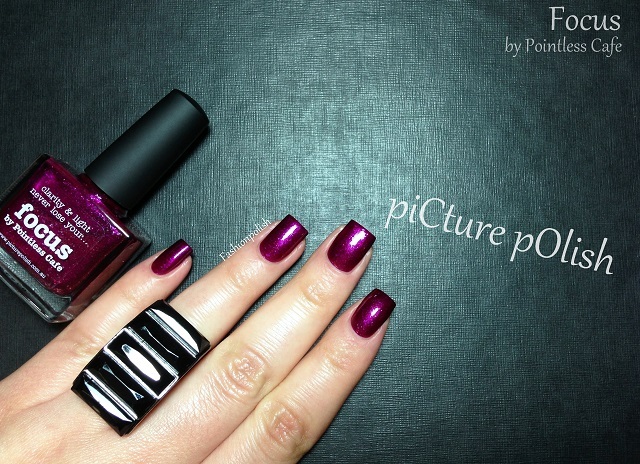 Fashion Polish: piCture pOlish Focus by Pointless Cafe! piCture pOlish Focus by Pointless Cafe! I have another piCture pOlish collaboration shade to share with you!!! 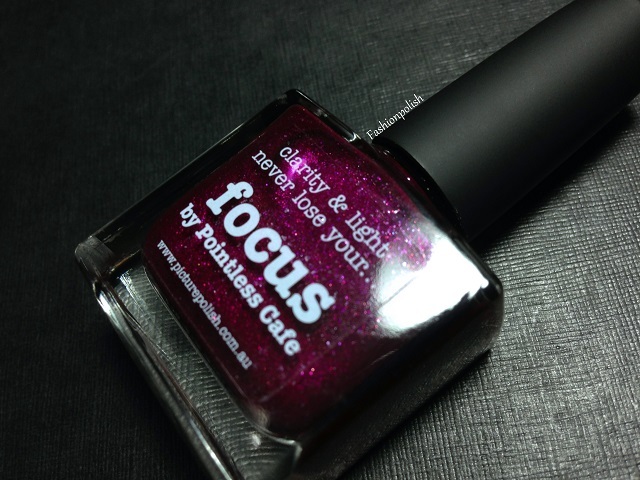 Focus is a red/violet/wine base filled with pink, red and blue shimmer as well as tons of sheer white shimmer flecks. It's a very complex and ladylike color and although I don't know Sheila, I can only imagine from her classy blog that fits her perfectly. Formula was simply flawless, offering a lot of control as well as great opacity and you're looking at 2 easy coats plus topcoat in all of these swatches. Of course, with a closer look, all the prettiness comes to life! What do you think about Focus? Did you grab it or any of the other collaboration shades? piCture pOlish Focus retails for AU$12 and can be purchased directly from piCture pOlish.com.au or through their international network. Thanks Iriel, it's very pretty indeed! IKR? Sheila and the PP did an amazing job! Wauw wat een mooie kleur paars, super! Gorgeous shade! May I ask what do you use as background for your pics? It makes your nails pop so gorgeous. mmmmmm...this is gorgeous! Has anyone compared it to BL Fiddlesticks? NP - flicking back and forward from your swatch to my swatch of Fiddlesticks I think Focus looks a bit darker, richer and more purple. And nicer!! I normally avoid fuchsias like this one but there is something about it, it's got texture but it's still so shiny - very nice! I bought Focus and Mallard. They were the first picture polish I bought. I love this polish. Focus is so amazing and easy to apply. I wasn't sure about the color cause I lean towered greens and grays but I love love love this shade. I am hooked on this brand. Thanks for the beautiful swatches.